I’ve always been a fan of tropical flavors. I live a long way from anywhere tropical, but it’s fun to grab a tropical drink, sit on the back deck in the sun, and imagine! One of my favorite flavors is pineapple. Whenever I see a new pineapple beverage, I always immediately try it. 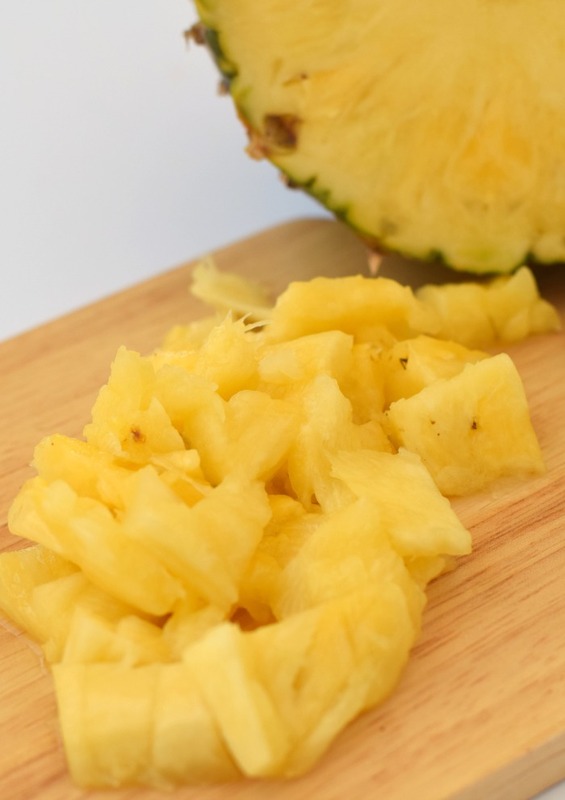 One way to intensify the pineapple is by adding these Pineapple and Coconut Ice Cubes. Cut up the pineapple. You’ll only need a few slices to make a tray of ice cubes. Cut up these slices fairly small. Add 1/4 tsp. of canned coconut milk to the bottom of each ice cube in an ice cube tray. 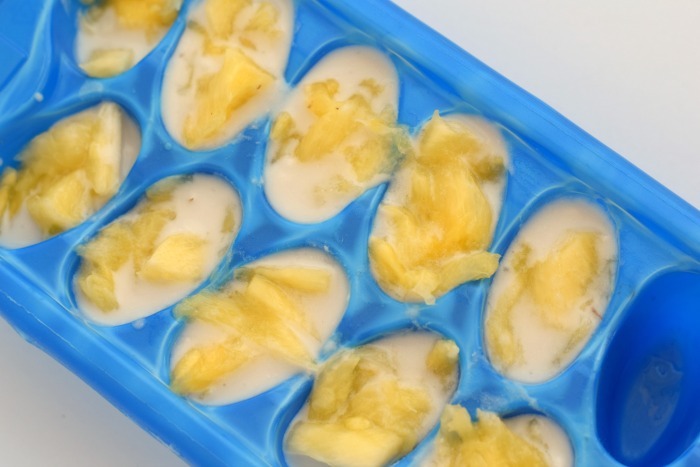 Press the pineapple pieces into the ice cube tray until they fill the cube section. Be sure that they are pressed into the coconut milk and that some of the pineapple juice squeezes out. Place the ice cube tray in the freezer for at least four hours. 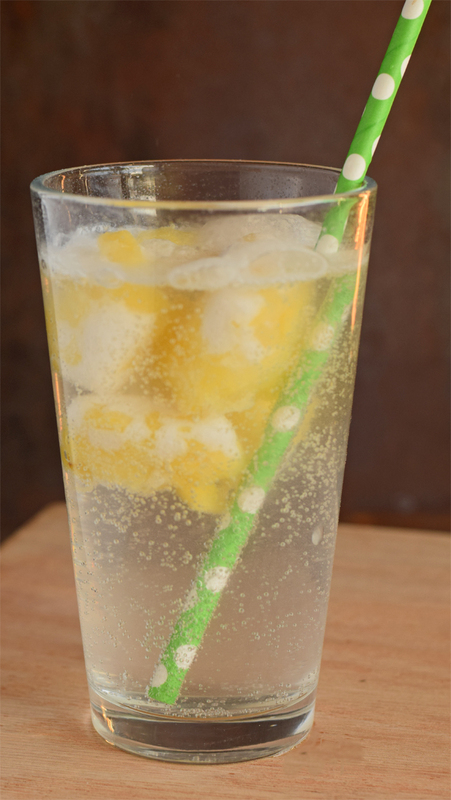 Pop out the pineapple and coconut ice cubes and add a few to the bottom of the glass. 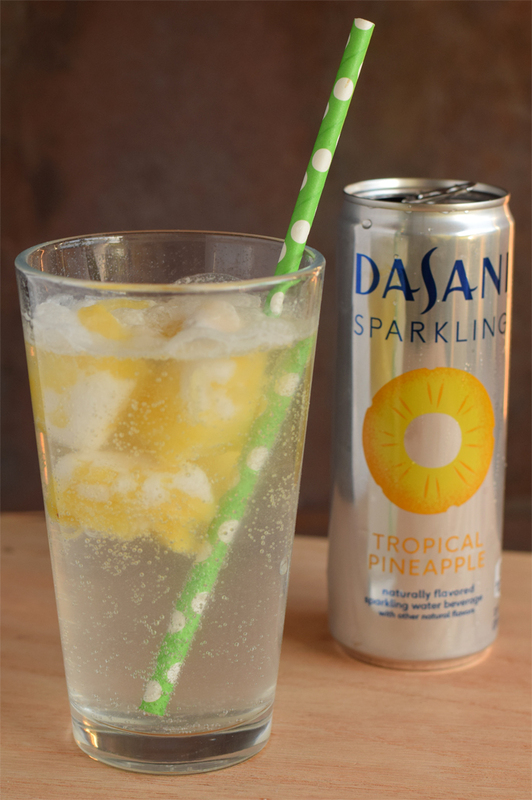 Pour in the Dasani Sparkling in Tropical Pineapple. Enjoy! There are several other varieties of Dasani Sparkling water beverage, including Raspbery Lemonade, Lime, Berry, Black Cherry, and Lemon. Use coordinating fruits to make fun ice cubes for any variety. 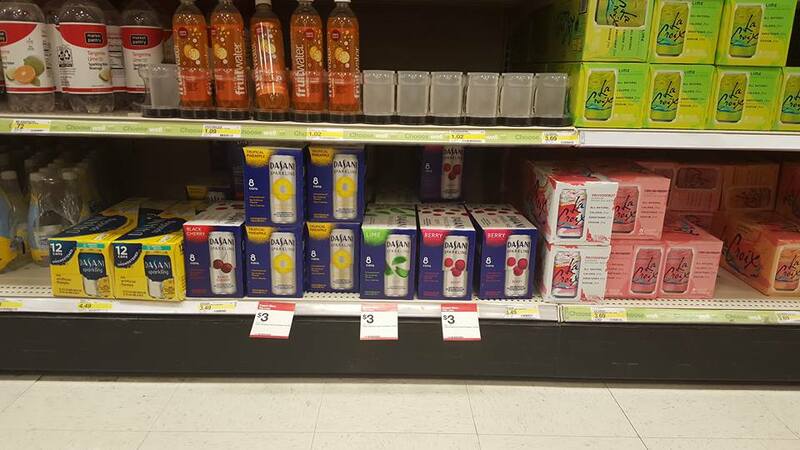 Many of the flavors are available at Target in the sparkling water section. 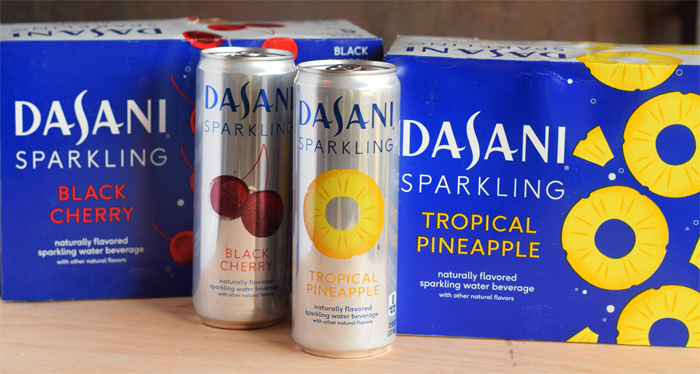 Dasani Sparkling is relaunching favorite flavors in NEW Dasani Sparkling sleek cans. 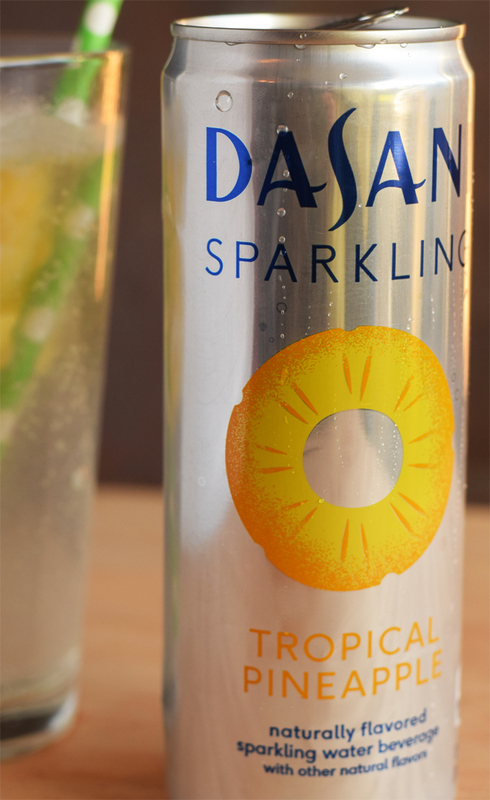 Dasani Sparkling allows for a healthier, flavorful beverage option to help any moment sparkle! Anytime I shop at Target, I always use the Target Cartwheel app. From 4/10/16-5/1/16, get 5% off Dasani Sparkling with the Cartwheel offer. The Dasani Sparkling water will also be on an Intro Target price of 3 for $9. Find more easy to make recipes that are refreshing and fun to make with Dasani Sparkling Water, and check out the Cartwheel offer soon! Yum. These look really good and so refreshing. A tropical drink on a warm night is the best. What a great way to not water down the drink. They look great too! What a great idea! This looks so refreshing – especially now that the weather is getting so much better! Flavored ice cubes mean a lot more delish flavor combinations! Love this idea! I am going to have to save this–it will be so refreshing when it’s so hot outside this summer! I’d love to enjoy a drink with pineapple and coconut ice cubes by the pool! This sounds like the perfect drink for warm Florida afternoons! Thanks for sharing such an awesome idea! We’ve done this before, very refreshing. I love the combination of pineapple and coconut. This has be super excited for summer! What a great idea…for any fruit! I am pinning this so I can remember to make these for when we are sitting by the pool this summer!